Remember that beautiful chicken run that we built a few weeks ago? It’s still lovely. The honeysuckle is growing. The chickens are sun bathing. The gardens aren’t being eaten. But there are three…four…or five gangsters that refuse to play by the rules. They come out. I throw them back in. They come out again. I throw them back and scowl at them. They come out again again. And then I catch them in my salmon net, shout at them for being gangsters, drink a beer, and contemplate my decision to have chickens. I’ve waited patiently for them to learn the rules – heck, it’s not that hard ladies. Stay inside the chicken run so that the neighbor’s dog doesn’t eat you. Stay inside so that I don’t have to spray you with the water hose to get you out of my tomatoes. Stay inside so that I can find your eggs. Stay inside so that I can eat my first dang homegrown strawberry in two years! Gangsters. The whole lot of ’em. So as much as I don’t like to alter an animal’s… ya know… stuff, I didn’t have a choice. I had to clip their wings. This can be the hardest part of the entire ordeal. These chickens, after all, are fast little boogers. And they know when they’re being jerks because they’ll run away and get all stupid and stuff. Which is when I bust out my salmon net and run around like a crazy drunk person, tripping over sage brush and bashing into the side of the greenhouse while I frantically throw my net out in their general direction. Whatever chicken. You’ve got it comin to ya. 2. Stick the chicken’s head under your armpit. Make her take a big, deep breath of your armpit and realize just how much trouble she’s in. Bah ha. Just kidding. But for reals, stick her head/neck under there. 3. Pull out her wing. See the big long flight feathers at the end? 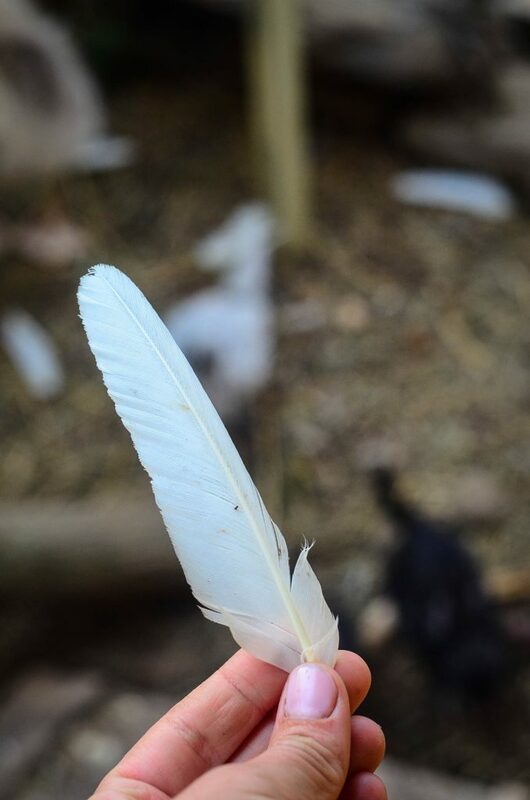 Those are the feathers that we’re going to trim. Just enough so that she can’t fly. This doesn’t hurt her one bit, at least physically. It might do some sort of psychological damage to her since she can no longer be a unruly vagabond, but I don’t really care about that. I care about my cucumbers not having pecked holes in them. Ten seconds of work just saved my gardens, and even possibly, the chicken’s life. An escaped neighbor dog can do serious damage to a laying hen in no time. And I’ve become so frustrated with these leghorns that I dare to think what will happen if I catch them in my beans again. 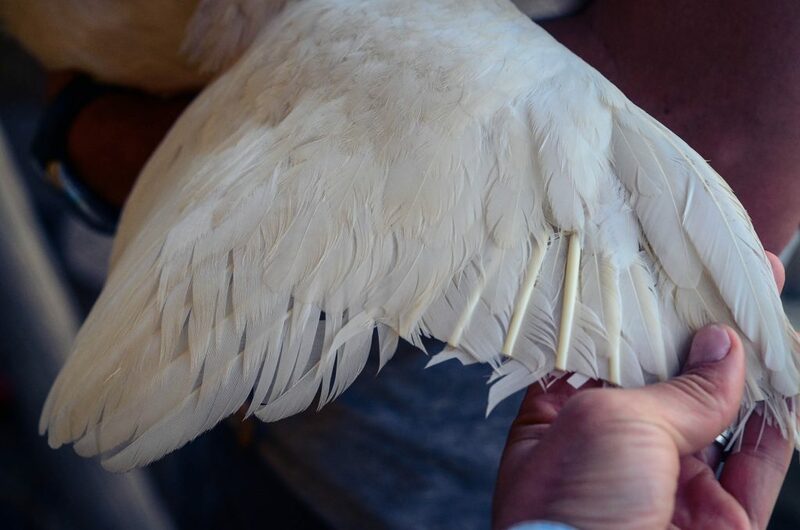 Trimming a chicken’s wings: A flock management technique that’s taming gangster chickens all over the world. « Show Me Your Baby Animals: Top 10! I’m happy to hear I’m not the only one who sprays the chickens when they break into my garden. You would think they would learn eventually, but no, they like to be rebels. Let me know how the double wing clipping works. I’ve always been told that you do one, because it makes them unbalanced and unable to fly. Graphic and text courtesy of “A Guide to Raising Chickens” by Gail Damerow. 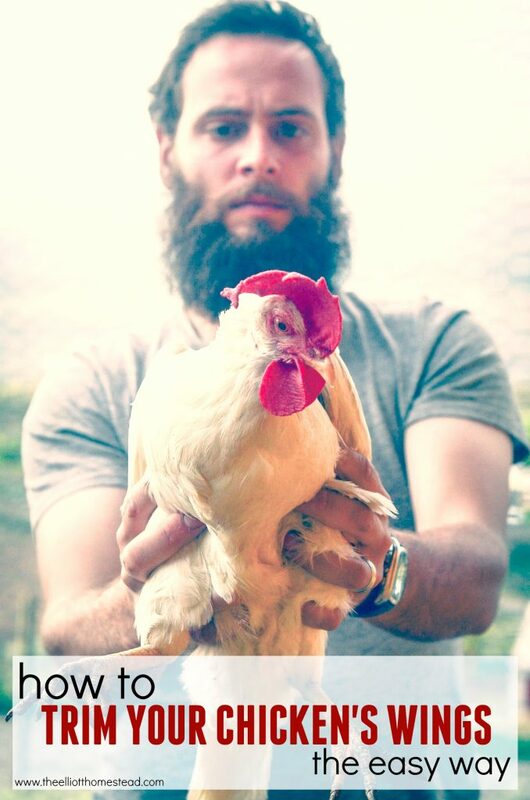 Chickens are such a pain. 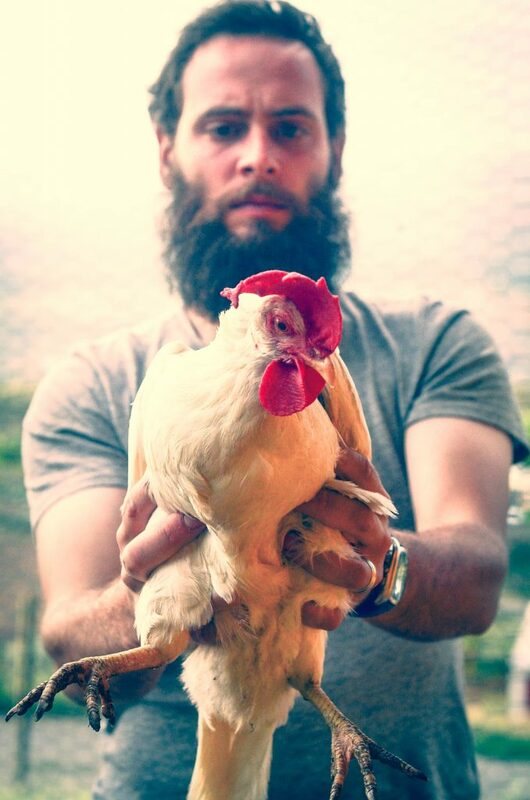 Every year, dh says, “This is the last year we keep chickens.” But for some reason, we persevere. Although, I’m seriously wondering why? I mean, honestly, even with the expense of free-range eggs (and truly free-range, from nearby neighbors), it is still cheaper to buy them than to keep up with these birds. The odd magnetism of the fowl. Hmm. Have you just not gotten to my comment with the link, or did you not want to post it? Ah, after I submitted the second one, I see it awaiting moderation, nevermind, and feel free to delete these last two! I would if I could figure it out, ha! 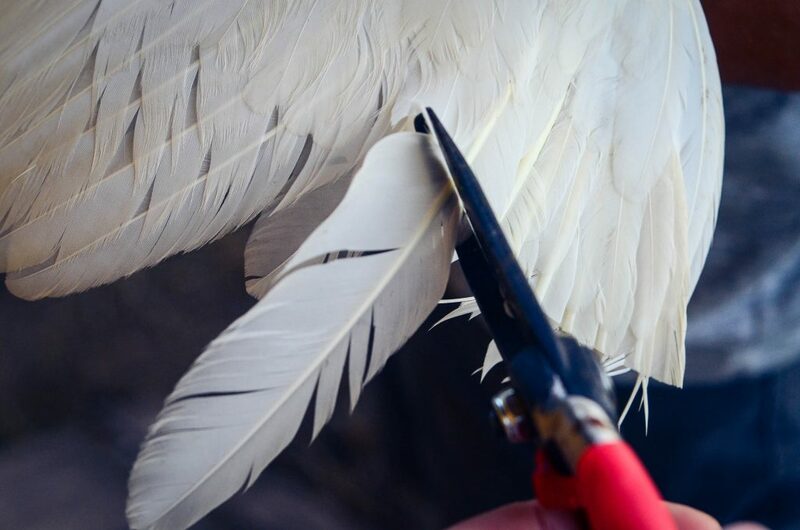 We currently only have four very well behaved ladies (or maybe they are just too big bottomed to get themselves off the ground), but we’ve had to clip wings in the past. We only clipped one side, but even so, we always worried that the neighbors were going to call the cops, because the chickens squawked bloody murder. What breed do you have? Looks like a white leghorn maybe? I’m wondering if that might be part of the problem. We raise heritage breed American Dominiques and have never had a problem with them getting into our garden (protected by a small chicken wire fence) or eating the goodies out of it. They would rather be free ranging around our yard for bugs or in the woods on the outskirts of our property. They really are the ideal breed for a homestead I think. 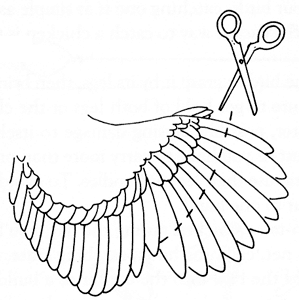 I don’t like clipping wings because it makes it harder for them to flee from predators. I gave up on my present girls not escaping and just fenced in the garden. Even though the fence is only 3 ft high with white reflective ribbon a foot above it, they don’t try to get in unless I don’t close the gate. The fence around their run is taller but they just fly right over. I loved my Leghorns too, but they were always the first to get out and no amount of wing clipping deterred them. And they got gotten by predators, while their fat sisters watched from the safety of the pen! In my experience, the heavier breeds, like Orpingtons, stay on the ground, in their pen, and out of harm’s way. Thanks for a lovely blog. I enjoy your writing very much! Happy to have come across your blog out of necessity. We just moved our little family out to the country and are trying our hands at homesteading. 6 chickens and 2 goats later, I’m still learning as much as I can! Well, I got a push this morning when a red fox got one of our chickens. My husband ran crazily after it and managed to get the chicken back! Seeing as though there was very little damage to the bird, I decided this was a good time to test out my plucking and dressing skills. I used your tutorial on that as well, thanks much! Now that’s done, I’m headed out to trim wings as our girls have been in the neighbor’s yard (which is very far away) and that’s where the fox got her. 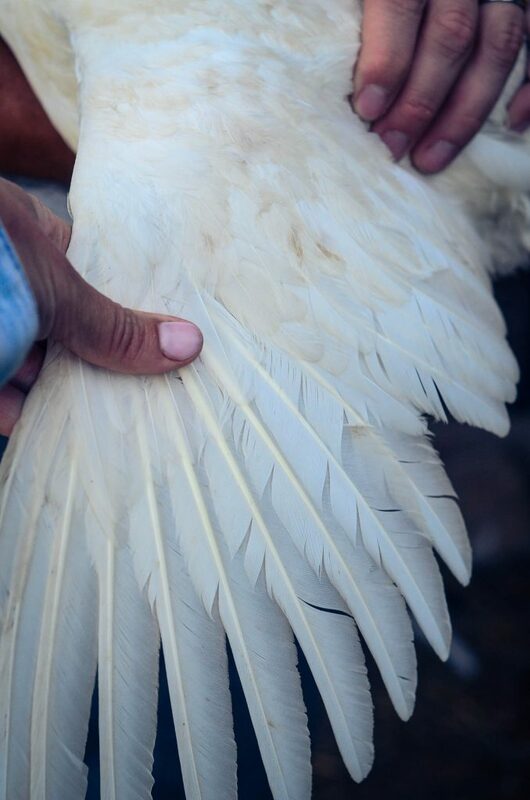 Hopefully trimming wings will keep them in their own yard and able to take cover in the coop when predators come. It’s 8 pm. My brother in law was coming home to bring his pitbull to stay for some days so I was puting away my planters when I saw my duck fly away, just like that, to the street were the dogs live. I had to run away, talk to my neighbour (hello lady who I barely know, I’m the crazy girl from that house, have you seen my duck?). 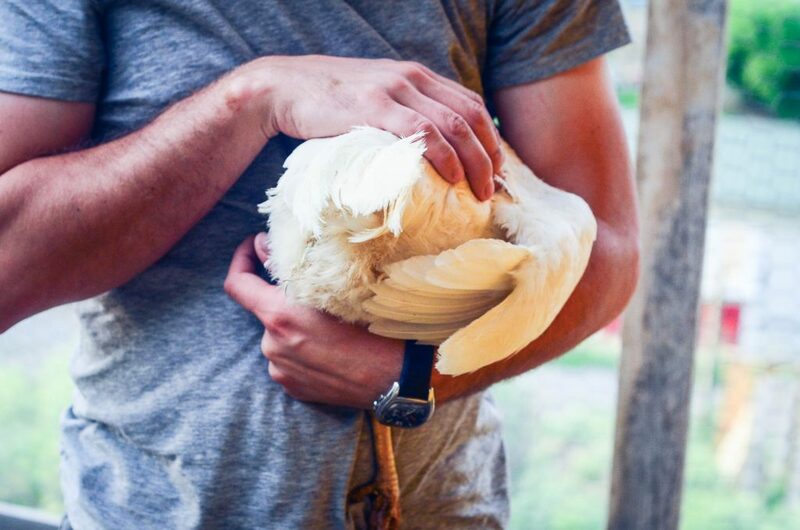 While she was looking, a man comes to the street “Hello crazy girl, are you looking for a white duck?” Yes! That’s me! It’s in your garden? “Not exactly” (pause when I pictured my duck in the mouth of his dog) “its in the roof”. So he went, to the roof of the lady, and chased my duck. Who of course flew away to the street whilst I runed after him screaming to the dogs to run away. For some miracle, I catched the duck, in the exact moment that my brother in law turns the corner, the pitbull jumps from the pick up and comes to say hello with all his happiness and teeth, and the duck was kicking me. Well, don’t ask how, but we all survived. I’ve locked the duck in the rabbit run and came inside remembering that I saw this post some time ago. I still have a full time job and live in the suburbs in less than 1/8 acre, but if this isn’t homesteading, then I don’t know what it is.